2-2 in the Hilton Super Contest with Tampa yet tonight!! Betting is 55% on the home favorite with the line moving from -4.5-101 to -5.5-107. Models favor Carolina, Variables strongly favor Tampa Bay and public betting no edge. When I placed this pick in the Hilton Contest it looked much better than it does now. Public betting had favored Tampa but betting has moved the number from 35% to 45%. So tonight it will come down to models vs variables. And for the games played this weekend the variables on Tampa bay our the strongest. But model clearly favor Carolina. I will be passing tonight but watching with interest to hopefully go 3-2 this weekend to add to my position in the contest. I went 2=2 in the Hilton SuperConest bringing my record to 15-9 with Tampa left for this evening. It was an interesting weekend as Tenn my one unusual play that was with the public worked out well. Although the other games I considered won also. Cleveland and Houston had no chance. While the Giants snuck in with +7.5. This was a very tough week for me so let us see if I can still salvage a solid 3-2 performance for this evening. 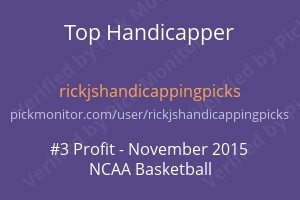 We had a one unit play along with a 1/2 unit play in the NFL and both lost. Houston +7 while being a good line never really had a chance and Oakland Under 52 also was not close. Which brings me to the 1/2 unit plays. There is nothing that says you absolutely have to bet the 1/2 unit plays. Logically they should underperform compared to the 1 unit plays and in addition have a higher variance. So if you are uncomfortable with that just do not bet them. As always I put out what I wager on but there is nothing that says you have to go exactly as I do. In addition, the Bet or Pass games are no plays. I do not bet on them but they are games I feel have a slight bias to that side but not enough to overcome the juice. 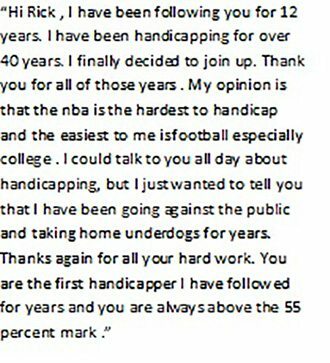 That is where your handicapping comes in. So far today we have 2 one unit plays going today. In addition, I sent out 3 Big Move games. As far as tonight’s NFL Game. It’s quite a bit of distance from being a play or a setup. If perchance we get to +7.5 I will take a serious look at the game. But I doubt that will happen. In the Hilton Contest, I have a +6 on the game. I will have more on the game before game time.